Gov. Bill Haslam introduces a speaker at a forum on the state's higher education programs at the governor's mansion in Nashville, Tenn., on Tuesday, July 10, 2012. NASHVILLE - Declaring Tennessee higher education "at a crossroads," Gov. 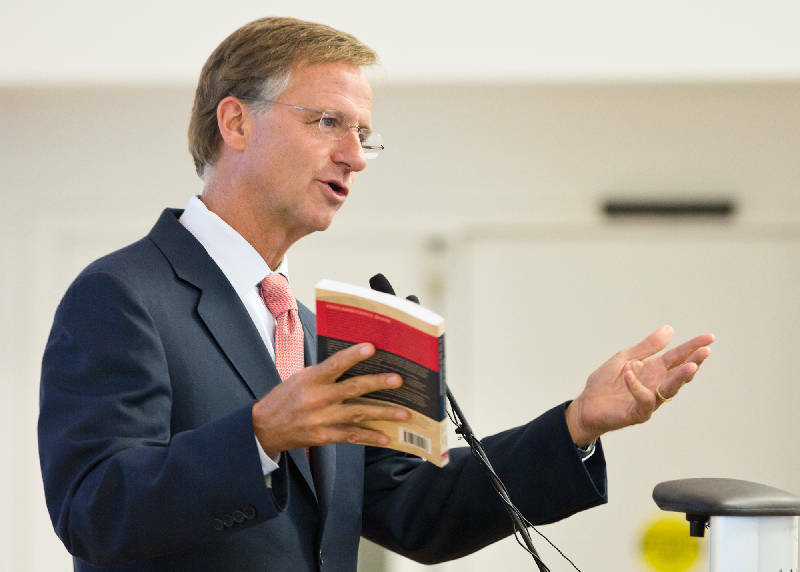 Bill Haslam on Tuesday began laying the political groundwork for a more cost-conscious Tennessee system that also generates higher numbers of graduates in well-paying fields demanded by employers. The occasion was a Haslam-sponsored forum for higher education and business leaders in which experts outlined various challenges facing colleges and students. Those areas range from declining state financial support to better matching the needs of employers. It's a national problem, the experts said, but Haslam brought the need-for-skills issue home in a state which has a low rate of college graduates compared with national averages. "It makes me sick when I hear Volkswagen saying we're hiring, but we can't find what we need here," Haslam told attendees. Last spring, Volkswagen began a national advertising campaign to find engineers and others in highly technical fields for its Chattanooga assembly plant. The company, which was expanding, said it was unable to find enough people to fill the positions in the Chattanooga area. Nicole Smith, a research professor and senior economist at Georgetown University's Center on Education and the Workforce, laid out national figures. They show the number of unemployed workers with high school educations or less is more than triple that of graduates with a bachelor's degree or above. "You have 14 million people just standing in line waiting for a job and then you have job vacancies that go unfilled for months" because applicants "just don't have the skills to do the job," Smith said. "Who's to blame? Well, there's a lot of blame to go around." Part of it falls on post-secondary education, she said, "because we're not doing enough to connect to the work force." She estimated that in just eight years, 2020, 56 percent of Tennessee jobs will require some post-secondary education. But that includes two-year associate degrees, she said and went on to note some graduates from community colleges in desirable fields make more than their counterparts with bachelor's degrees in areas where demand is lower. Smith and others said students need to know that in a time when student debt can be staggering. There was also plenty of give and take with members of University of Tennessee board of trustees and Board of Regents members. UT trustee Jim Hall of Chattanooga complained about the cost burdens on higher education because of remediation classes universities must provide to students who were not adequately prepared in K-12. Those same universities produce the "vast majority" of K-12 teachers, Hall said. Regent Tom Griscom, also of Chattanooga, suggested Haslam think about applying the "top to bottom" review he implemented for general government upon taking office to higher education. Funding, Griscom said, has been based on students filling seats, although that is beginning to change under the Complete College Act. Passed in 2010 at then-Gov. Phil Bredesen's urging, the law provides more money to institutions doing a better job in graduating students and less funds for those that don't. Haslam said higher education should be "ruthless" about costs. He later told reporters he is considering such a review but wants an impartial entity to conduct it. The governor plans to embark on a seven-stop series of regional tours meeting with local higher education officials and business leaders.